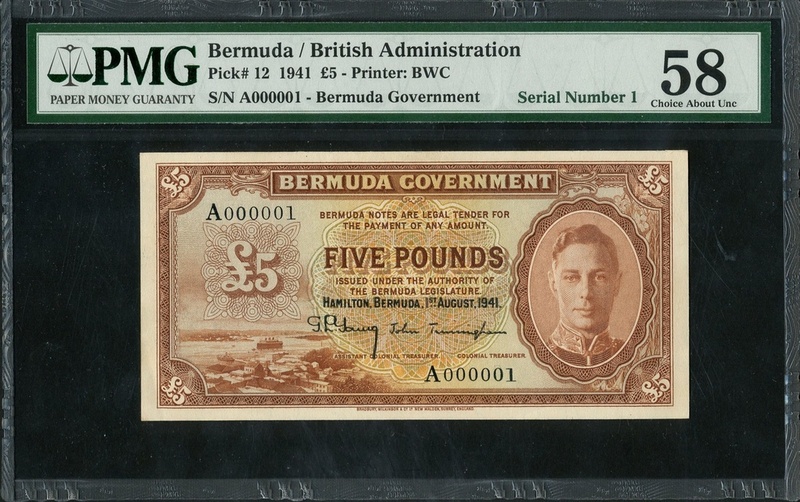 Bermuda Government, 5, 1 August 1941 (1942), serial number A 000001, dark brown and pale green and orange, head of George VI in oval frame at right, value at left, at low left a vignette depicted the cruise ship Monarch in Hamilton harbour, the signature of the Assistant Colonial Treasurer G.L.Young at left, of the Colonial Treasurer John Trimingham at right, reverse brown and pink, arms at centre, value at left and right, (Pick 12a, TBB B112a, Aspen P.76), in PMG holder 58 Choice About Unc. This is the Banknote Book plate note, ex-David Saul Collection, Spink 2013. This note is one of the British Commonwealth series most elusive banknotes and a classic rarity. To find an example of the brown 5 in any condition is difficult, to find one in this grade an impossibility and a number 1 to boot. A gorgeous example and surely the centrepiece for any collection. Important!